If Batman has the Joker, I have inflation. Inflation, my great and worthy opponent, has shown me yet another side of his wicked, wealth-destroying ways. Let's have a look. Inflation is sometimes called a "stealth tax", as people are robbed of their savings and pensions by their government without any notice. It is more than that, it is a double stealth tax. Here's how. Imagine 6% inflation, understated as 2%. Imagine further that a $100 investment grew by 4% and you paid 25% tax. On paper, you made $4. After taxes, you kept $3. According to official inflation, you made $1. In reality, you lost $3. You made money on paper, and you paid taxes on that paper profit, but in reality, the government robbed you twice, by taxation and by inflation. Even more insidiously, if not for inflation hiding the loss, you would have been able to write off the loss. Instead you get stuck with a tax bill for losing money. In this particular case, inflation is a triple stealth tax. Imagine you're in Serbia in 1993, and you bought a sack of corn for 1 dinar. It increases in price by a factor of 100 after six months. 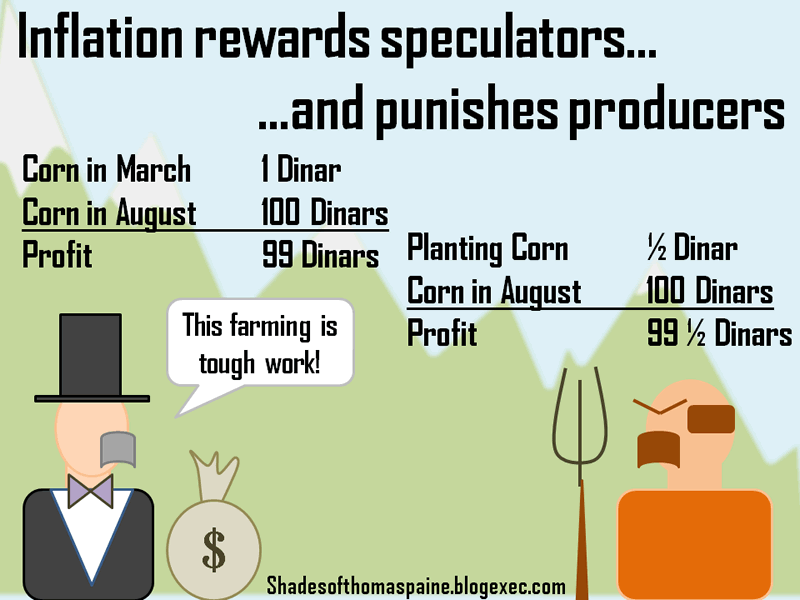 Imagine further that your neighbor grew corn at a cost of 1/2 a dinar a bag. When you go to sell your corn, both you and the farmer gross 100 dinars. You net 99 and he nets 99.50. Because of inflation, the productive activity of growing corn and the useless activity of hoarding it are indistinguishable in terms of profit. In going through all the trouble of actually producing corn, your neighbor made an extra half percent. Furthermore, imagine the double stealth tax penalty you and your neighbor would pay on that 10,000% paper profit. Because of these perverse incentives, when inflation gets high enough, people abandon most productive activity. This exacerbates inflation further, since fewer goods are being produced, driving prices up further, which encourages even more hoarding. Sitting on resources isn't only profitable when inflation is ultra-high. 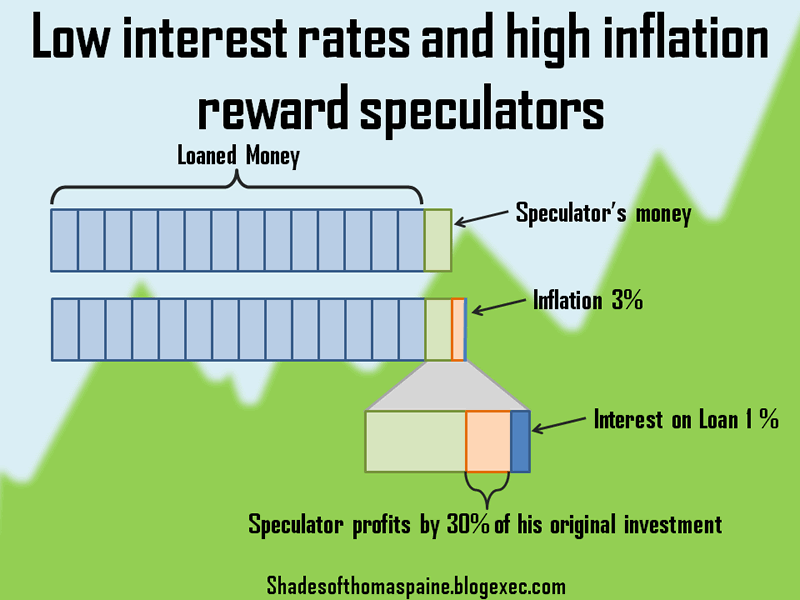 Speculators the world over borrow money to amplify the profits of even small increases in price. The small, consistent increases in price created by modest inflation can be exploited by speculators with access to cheap credit from central banks like the Federal Reserve. Imagine a megabank buys $1.5 billion in oil futures, and the price of oil goes up 3% due to inflation. If the bank is leveraged 15 to 1, as is legal, they can control $1.5 billion of oil while only using $100 million of their money (generally the customer's money). As the price of oil inflates 3%, the bank makes $30 million in profits after paying 1% interest on the loan. All for doing nothing. Because interest rates available to megabanks are well below the rate of inflation, and the money printers have essentially guaranteed that inflation is here to stay, futures contracts win more than they lose. If inflation were zero, futures would trend slowly downward as industry becomes more productive and efficient, so speculation wouldn't be nearly so attractive. 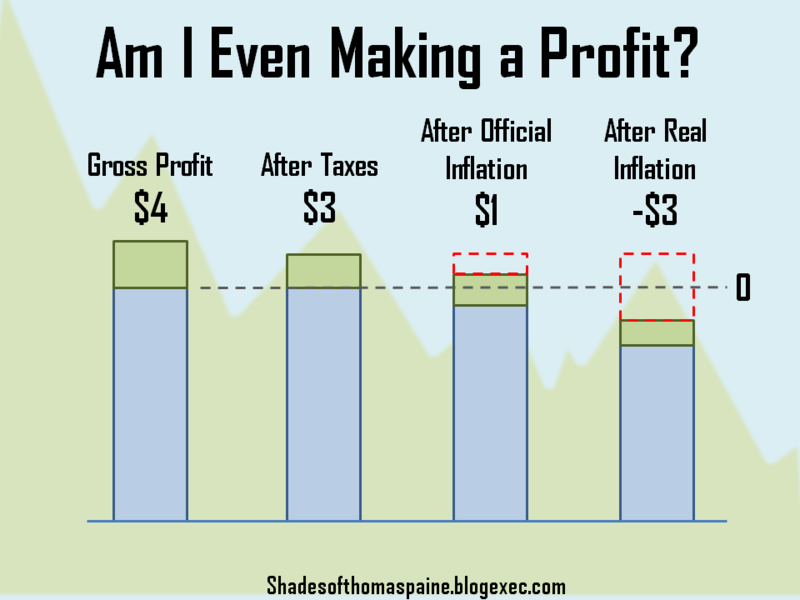 Because of inflation, sitting on resources is often equally or more profitable than actually producing them, especially because of the favorable tax status afforded to "investments". Steady growth in the financial sector, accompanied by a steady contraction of the manufacturing sector is the harvest we reap when we inflate our currency. The power to counterfeit money is never beneficial to anyone but the counterfeiters and their friends. Anyone who says otherwise is either misguided or dishonest. To imagine that by creating excessive taxation, confusing fair assessments of value, stealing people's savings and promoting non-productive speculation on a grand scale might somehow benefit society at large is to deny the entire history of paper money and its grievous consequences.